I hope there are links here that will be helpful and useful. These are ones that have come to my attention. Feel free to contact me about any other ones. It is definitely possible to be disabled with a good quality of life AND have a bit of style. I hope these sites help you to make living your life more enjoyable and cut out some of the stress. If you know of any more please let me know. Blue Badge Style The strap line is ‘Redefining Disability With Style’. A website that reviews hotels restaurants and theatres etc mainly in the London area. There are reviews on items for daily use that are elegant and suitable for people with a physical disability. designed2enable The strap line is ‘Stay active with style’. A website that lists award winning, functional and stylish products for daily living for people with a physical disability especially if it is connected with mobility. Clinicspeak Clinic Speak is a resource for people with MS. It is an ongoing project by Professor Gavin Giovannoni as a development of his Clinic Speak blog posts on the Barts MS Research Blog. EDSS Calculator If you want too do your own EDSS assessment The assessment should take between 5-10 minutes to complete and will allow you to calculate your own accurate EDSS score. London Underground Map If you need to use the London Tube system but cannot use the stairs then here is some very useful step-free information, stations with lifts etc. My Easy Suppers A web and Facebook page shoeing easy to cook meals. The author has MS and now has to use a wheelchair. The food looks scrumptious, great photos and worth investigating. 9 Hole Peg Test The 9 hole peg test is the gold standard for monitoring arm and hand function in clinical trials. This cardboard version gives you independence from your neurologist, empowering you to test and monitor your own disease progression. Over 96% of Government Websites Hide Disabled Men and Women on Their Site Very interesting read on the pictures of discrimination of disabled people. This also applies to companies selling products for people with a disability – GRRR. This is not an exhaustive list of British Multiple Sclerosis charities and organisations. I’m sure some have been omitted, please tell me and I will add them to the list. Mirandasmsblog A blog from Miranda who is the MS Nurse at the Bedford MS Centre. The aim of this blog is not to provide information about MS – there’s already great stuff available, ( I’ll post links to the best sites) – or to be first with the news, or to tell you things that you can find out about easily elsewhere. Missing Pieces To identify the gaps or ‘missing pieces’ in knowledge, awareness, treatment pathways and care plans, which are preventing people with MS from accessing the right treatment, the pharmaceutical company Sanofi has launched a campaign in the UK called ‘The Missing Pieces’. Multiple Sclerosis Answers An American organization that answers questions. This link directs you to the Multipe Sclerosis section. The information looks to be very detailed but it is hard work. There are no pictures or ‘white space’ that make it easier to read and pick out the important points. Multiple Sclerosis International Federation Independent information from MS professionals worldwide. 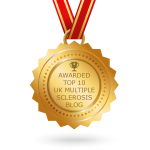 Multiple Sclerosis Research Blog A blog site run by Professor Giovannoni and his team at the Barts and The Royal London Hospital. This is a blog for people with MS, it reports on and interprets research news and allows you to make comments. Well worth a read. Multiple Sclerosis (MS) is the most common progressive and disabling neurological condition affecting young adults in the world today. It is possible to write and submit your own blog but it does need to be connected with MS issues that will interest others. I have written a few guest blogs. As a result of one of them the MS introduced a 1K walk for people who cannot manage to walk at least 5. Multiple Sclerosis Society Multiple Sclerosis Society The official website for MS with information about fundraising, events, research, life with MS, news and events and disease details. Multiple Sclerosis Support Multiple Sclerosis Support Centre. Multiple Sclerosis Trust UK charity providing information for anyone affected by multiple sclerosis including symptoms, treatments and living with MS.
Pediatric Demyelinating Diseases Foundation It began as a Facebook group called Pediatric Multiple Sclerosis Alliance whose purpose it was to connect families of children with Multiple Sclerosis. Positive About Multiple Sclerosis This is a website dedicated to giving information to those who have MS, those affected by the condition and people who may just want to know more about it. Shift MS Shift.ms is a social network run by its users where young MSers meet, share experiences and support each other. Northable Equipment Plus Northable Equipment Plus is a New Zealand mobility shop. It can offer you the option of shopping for the disability equipment and daily living aids you need online, from a source you can trust. It specializes in Mobility Scooters and offers the facility to hire mobility equipment. This is a big advantage and I wish more companies provided this service. Handicare Stairlifts UK Handicare provide stair lifts, mobility fittings, help and advice to a wide range of people. counselling-directory.org.uk Counselling Directory is a confidential service that encourages those in distress to seek help. The directory contains information on many different types of distress, as well as articles, news, and events. To ensure the professionalism of our website, all counsellors have provided us with qualifications and insurance cover or proof of membership with a professional body. Connect Dacorum is a partnership between the business, public and voluntary sectors that actively participates in creating a better quality of life for all in the Dacorum (Hemel Hempstead) and surrounding area.They provide information and expertise on community involvement opportunities for organisations of all sizes and support our members in the delivery of their Corporate Social Responsibility objectives. Enable Holidays Accessible holidays abroad for wheelchair-users, slow walkers, people with limited mobility, their families & friends. All accommodation personally audited. Heathrow airport, guide for travelers who have special needs. This is part of the general London Heathrow guide but goes directly to information for passengers who need assistance, for example wheelchairs at at the airport terminals. LDN Research Low Dose Naltrexone (LDN) is a drug that may help regulate a dysfunctional immune system. misterwhat MisterWhat provides a comprehensive business directory of UK companies. The local listings are free to consult. You can find the company, firm, shop, restaurant, product or service you are looking for quickly and easily. Rehab 4 Addiction It offers a free hotline dedicated to assisting people suffering from drug, alcohol and mental health issues. Rehab 4 Addiction was founded in 2011 by people who overcame addiction themselves. You can contact Rehab 4 Addiction on 0800 140 4690. Therapy Directory Lists therapists who are registered with a recognised professional body or those who have sent us copies of their qualifications and insurance cover. USA Tech Guide Guide to wheelchairs, mobility scooters, and assistive technology choices The TechGuide for all types of assistive equipment.